Ashbee Design: Art in the Bathroom? Absolutely! I have always enjoyed decorating the bathroom. 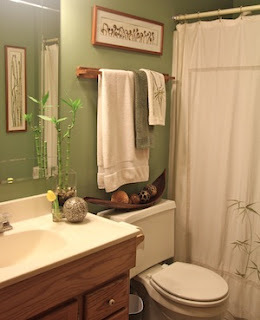 Not only is it the smallest room in the house (my house anyway) which makes it the easiest to change, but people often study the bathroom decor more so than other locations. And, if you follow my blog you'll find this as no surprise, I often choose my artwork from the contemporary craft world. My downstairs bathroom has three works acquired through craft shows. I have two pressings by Maggie Lake from Vermont Botanicals. I have visited her booth often over the years and my favorite natural pressing is of the fiddlehead ferns. I will be doing a series of posts on ferns because I do find them to be a wonderful design inspiration. I especially like this arrangement constructed of dried and pressed ferns. Each one is different but the composition is always playful. Seeing the dancing ferns always makes me smile. On an opposite wall I have the California horsehair composition. What I love about these is the combination of the interesting frame proportions combined with Maggie's incredible sense of composition in arranging the dried plants. Visit her website to see more. I specially like (but don't yet own) the Jack-in-the Pulpits. On a different wall in my bathroom I have a trapunto quilting completed in simple, unbleached muslin. 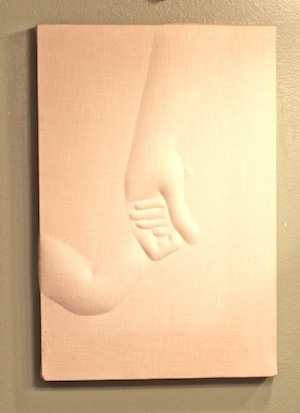 It is a meaningful composition of a mom holding a child's small hand. The entire subject is carefully displayed using only a simple thread line and a little stuffing. I acquired this years ago long before I started keeping track of the artists that crafted my collection. I would give credits and include a link but I have not seen this craftperson at a show in many years. I will give credit if anyone can identify it. It came into my life at about the time my daughters' hands were this size and always reminds me of the joys of being a young mother. Bathrooms are impossible to photograph because the can be so tiny. Mine is no exception. David and I built our house in 1978 on a very limited budget. Although it is a creative structure, we were practical about things like bathrooms. I make mine special through the decor, not the room. Here is the current look, painted a fern green with oak and wood accents, and including the Vermont Botanical pressings and, of course, more balls!